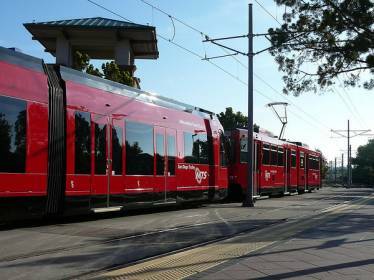 In the winter of 2012, Portland Bolt was chosen to supply the Overhead Catenary System anchor bolts for this SANDAG trolley project. Our customer upgraded 15 miles of the existing Blue Line from downtown San Diego to San Ysidro in California. We manufactured 31,000 pounds of 2” and 21⁄2” diameter F1554 grade 55 galvanized anchor rods complete with welded flat bar anchor plates. Portland Bolt was chosen for our reliability and quality. We manufacture and galvanize in house so we control both the delivery schedule and quality of product from start to finish. We also make the welded flat bar anchor plates in our facility.